The BJP has become averse to black to such an extent that there has been a virtual ban on anything black. A spectre is haunting BJP in Assam, the spectre of ‘Black’. Once revered as the Jatiyo Nayok (the national hero), Chief Minister Sarbananda Sonowal, along with other BJP ministers and leaders in Assam are being welcomed with black flags ever since the much-debated “Citizenship Amendment Bill” has been passed forcibly in the Lok Sabha. 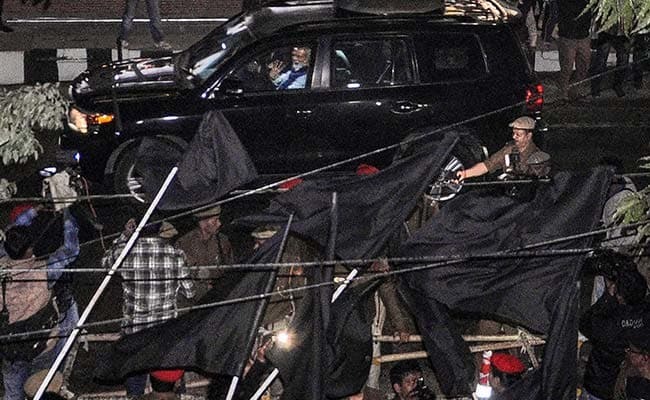 Even Prime Minister Narendra Modi could not escape the heat of the black flags. When Modi arrived in Guwahati yesterday evening, he found himself amid warm greetings of the BJP ministers and leaders including Sonowal. But his journey was not smooth all through. The PM convoy proceeded towards Guwahati city from the airport, and on this way falls the Gauhati University campus. PM’s convoy couldn’t escape the main gate of the Gauhati University where students in hundreds of numbers were ready to greet him. They greeted him with hundreds of black flags, raised slogans like “Narendra Modi, Go Back, BJP Govt Down Down”, burnt the effigy of Citizenship (Amendment) Bill, and so on and so forth. Gauhati University students’ black flag protest was not the only case of protest greeting for the PM. There were black flags at numerous places as PM headed towards the Raj Bhavan from the airport. Former ally of BJP, the Asom Gana Parishad (AGP), held a massive torchlight procession opposing Modi’s visit and the Citizenship Bill. Today, when Modi did the Bhoomipujan at the AIIMS site in Changsari, Black Day was being observed throughout the state. Black flags and black balloons were flown in the sky. The PM is on a tour of three Northeastern states where he is going to inaugurate several projects including an airport at Papum Pare district of Arunachal Pradesh, and a six-lane bridge over Brahmaputra, connecting Guwahati city with North Guwahati. The Black Flag movement has taken roots in the state right after the passage of the Citizenship Amendment Bill in Lok Sabha forcibly. The first protest meeting was held on January 7 – observed as Dhikkar Divas (condemnation day). It is in this protest that black flags were hoisted by intellectual and leader of the movement against the citizenship bill, Dr. Hiren Gohain. Sedition charges were slapped on him along with Akhil Gogoi and Manjit Mahanta just few days after the meeting. Ever since, whenever the ministers and the BJP leaders visit, they are being welcomed with the black flags and slogans opposing the citizenship bill. Sonowal reportedly had to cancel several scheduled meetings only to avoid people’s wrath. For the few meetings that he managed to attend, he had to take refuge in the helicopters – even for distance as short as 40 kilometre. Assam Finance Minister Himanta Biswa Sarma was disrupted on his way to inaugurate a government hospital in Nalbari district, Sarma’s hometown. There was an intense scuffle among the activists of the AASU (All Assam Students’ Union) and the activists of RSS, BJP. The BJP has become averse to black to such an extent that there has been a virtual ban on anything black — be it black cloth, black plastic, black balloon etc. Incidents have been reported where police were instructed to monitor people buying black clothes. Police have also allegedly barred people in black clothes from meetings that were addressed by the BJP leaders. Even women were questioned regarding their black blouses they might be wearing during such meetings. The adjoining picture of a lady is removing the black jacket of a kid depicts the extent of BJP’s draconian monitoring. This incident took place in Bihali in Upper Assam’s Sonitpur district, where Sonowal was supposed to attend a meeting. After the photo went viral, the mother of the kid was allegedly asked by the BJP activists of Bihali to say that there was no pressure from the security forces to remove the black jacket of her kid. The mother did give a statement in the media saying so. But, later on, a video shows the mother revealing how she was intimidated by the BJP activists, and reportedly was forced to say so.. The black is haunting BJP in Assam like never before.